The mayor of San Jose criticized both sides of the political aisle following an evening of rowdy, and sometimes violent protesting, during a Donald Trump campaign stump. 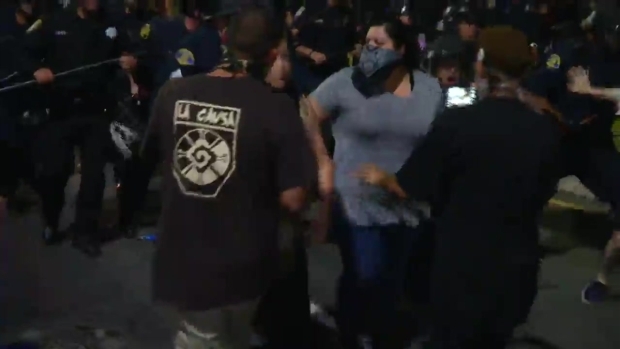 “There is absolutely no place for violence against people who are simply exercising their rights to participate in the political process," Mayor Sam Liccardo said Friday of the Thursday night rally, where a police officer was assaulted, a woman was egged, and others were bruised outside the San Jose Convention Center. In an unusual move, the San Jose Police Officers Association also issued a statement of condemnation, putting the word "protesters" in quotes. "I'm disgusted by the violent attacks yesterday that have no place in our society or our political process," union president Paul Kelly said. And vice president James Gonzales added: "Our community must band together against those who would soil our First Amendment freedoms and bring to justice those that chose to act like cowards." Both asked the public to turn over any video of criminal activity. Furthermore, de-escalation techniques are important -- not just when someone has a weapon. We are not an “occupying force” and cannot reflect the chaotic tactics of the protestors. Instead, we achieved our goal of clearing the streets and making arrests in an appropriate manner. Our officers should be commended for both their effectiveness and their restraint.